I was so happy to find this board! ...I'm 49, female, and live in South Dakota. I started having problems in Jan., I had pain in my bottom, right rib and went to the ER...they x-rayed it and found a tumor in my left lung.The pain in my rib has pretty much gone away, now I have pain and weakness in my left sholder and elbow. Had CT's, bone scans, MRI, 2 biopsies. The first biopsy there was to much bleeding so the second was a needle guided biopsy, Dr. said I didn't have cancer but we had to watch the tumor close. About 2 weeks later he called again and wanted me to have another scan done. A week later he called and said it is cancer. He set up the appointment with my surgeon who I met with today. I go into the hospital on the 26th of this month. 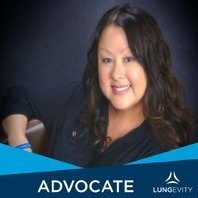 I had 1 sister die of lung cancer and 1 sister die of liver cancer about a year apart. Welcome! I read your answer to my tattoo post and then found your post here!! I too, am sorry for the losses of your sisters. If anyone were 'due' to beat their cancer, it is certainly you- it seems like cancer has taken enough from your family. I know it must be scary to you to have to go through this, it was for all of us and the history in your family must compound it. But please know that lung cancer IS survivable. I am living proof, 3 years this month. Although it doesn't feel like it I'm sure, it is lucky that you are a candidate for surgery. Good luck with your operation, and please keep coming back to let us know what's going on with you. Have gone thru pretty much the same things...Try not to be too fearful, it may well not be as bad as u might fear. I lost one lung, but lot of times it can be only a part of lung, depends on how the tumor is situated, etc. You have found the right place for gobs of info and support from lot of great folks here. Keep posting and ask anything you need to know about. Good luck w/surgery if necessary, and take care. Come here often if u can...helped me more than I can say. Rich B. Welcome! I am so sorry you need to be here but you found a great group. I was just diagnosed 2 months ago and still have so much to learn. Sorry about the losses of your sisters.Keep us updated on you. You will be in my thoughts. I am sorry you had the need to look us up but glad you found us. If you have questions about your surgery, treatments, pain meds or just want to vent this is the place. There is lots of support and information here. Again, Welcome. Welcome! This board has been my life-line since January. I think you will find, that we are so supportive and try and help with whatever we can. Where in SD are you? Let me know if I can be of any help. Hi.. I am not that far over the border. We are all here to help. Have you gotten ahold of a little teenie weenie pill to help with the jitters and sleeplessness? You may need a couple...just enough to take the edge off. We are here... we have been where you are. Very important to get good help and good treatment. First of all I want to thank all of you for the support...I was so lucky to have found all of you! I'm crying right now...mostly due to relief that I have someone to talk to about all of this! I tried to talk to a couple of friends but they are scared I think and just don't know what to say!...Anyway, to answer all of the questions. I live in Aberdeen, I have 2 children who I adopted as infants, they are 17 and 19 now. Both children are handicapped, they have Fetal Alcohol Syndrome, my son functions at about a 6 year old level and my daughter at about 15 years. They are great kids and are struggling to understand what's going on...all they know of cancer is that you get it and you die. but I think I have convinced them it don't have to be that way. Their father and I are divorced but I think they will be OK with him if it comes to that which I don't think it will. As far as the "jitters" go...Oh Boy! Ya, i've sure had that! But I have to "keep it together" for the kids. I have had some sleeplessness too but that's OK, gives me time to "re-group". My Dr. has a very good reputation in our area and he is willing to talk and he is very patient with all of my questions. I have faith in his ability. I also had blood clots in my lungs in October and am on Coumadin (blood thinner) and I was concerned about what effect that would have on the surgery and he took the time to explain all of that to me. He didn't mention VATS surgery to me, I don't know what it is but maybe they can't do it due to the placement of one of the tumors...it is very close to my heart. As of yet we don't know the type of cancer but the Dr seemed very interested in my symptoms...tired, weight gain , hot flashes, sweating, etc...So far my Dr.'s have said the rib pain and the sholder and arm pain and weakness are from the tumors putting pressure on certain nerve endings which causes pain to radiate to other parts of the body. I know when my sister had liver cancer it caused her left sholder to hurt!...Again, thank you all so very much for your support! I appreciate it so much! Welcome to the site. I am glad they have caught your cancer early enough to remove it. I just wanted to add my best wishes and hello to the mix here. You can already see that this is the most incredible place to find support. It has been a god send for me and I am sure you will feel the same. Welcome! I hope that you find all of your answers here. It's the place to come that's for sure. Don't be afriad to ask anything. We're here to help. Best of luck and keep fighting!!!!! Hope you will have a good treatment plan soon! I'm wondering about the symptoms 'weight gain, tiredness and sweating'. Maybe this is 'just' menopause? Sounds like you have your hands full, for sure. I hope you are thinking about help with your kids while you are recovering. When friends say, call me if you need anything, tell them YOU WILL! You may not think you will need help now, but the little things will come up and it will be a luxury having friends to do even the littlest of things, like running to the grocery store, drugstore, or a couple loads of laundry, a meal or vacuuming. Do you have the radiology report? Can you write it out so that we can take a peek at it. There are some pretty smart cookies here who can help you move through all of this. You are right, the VATS procedure isn't for all lc. Video Assisted Thoracoscopy doesn't work so well in the center of the chest. I was thinking that maybe you might have a tumor in the tippy top of your lung causing the pain...? Is your ex-husband close by? Is he a support for you and the kids? Maybe get a bottle of those ativan and give them out to your friends too! Funny how much power the words lung cancer can shake any sane person. It might be important to you about thinking about getting a second opinion on your diagnosis and treatment plan. You need to gather as much information as you can. Because you have a good reltionship with your doctor and he is a good guy, he would probably want you to see another one or two to see exactly what is going on and to make sure that you are getting the best treatment. Hang in there. We are all still here for you! i am so glad that you found us. I am so sorry to hear of your diagnosis. Cancer is such a booger. I keep describing it like it was a wave that affects everyone in its path. I live in Brookings, South Dakota, and my dad is seeking treatment at Mayo. It has been amazing, and we are so fortunate. Where do you live in our vast state? haha! I know Mayo recommended a doc in SF, Dr. Huber, who was trained at Mayo...Dad opted to get all treatments at Mayo even so. Let me know if you need anything...you have come to an excellent place. LCSC is therapy for me. My husband says I am addicted!! Just got back from another Dr. visit with my local Dr...He has cancer too, today he told me "don't believe you have it until you wake up from your surgery". I talked with him about all of my symptoms and he said it sounds like a carcinoid tumor. Something to do with hormones, weight gain, etc...Anyway, tomorrow I have blood work done and I meet with anesthesia, the next day I have a stress test and an EKG then Monday this will all be over! My X is working out of town right now but I think he comes back today, i'm going to try to talk him into helping out a little. but I don't have much faith in him! Oh well...my niece is going to stay here with the kids when i'm gone and my neighbor (friend) said she will help with them too. I thank God for them! Welcome. I hope the board is valuable to use - for information or to just talk. I'm always sorry when a new person signs up, because it's another one fighting the disease. I wish you the best in your surgery - let us know how it goes. There are just some things that I am not clear about. You had a biopsy done but it was inconclusive at first and now you know it is cancerous but your PCP is guessing that it is a carcinoid? You should find out exactly what kind of cancer that you have before you subject yourself to surgery. Carcinoids are treated much differently than other lung cancers. The pain that you have in your shoulder is of consequence as well. Have they ruled out a Pancoast tumor? Your biopsy should be sent to the pathologist at the Mayo clinic in Rochester, MN. There he is. He is the tops in the world for reading difficult to interpret lung cancer cells. Please inform your doctor of this brilliant top doctor. Everything is going to be okay. It is imperative that you make every effort now in correct diagnosis and treatment plan. it's a rollar coaster ride, for sure. I am so sorry for all the loss you've had. we're here to support you in your own battle. Believe me...i'm confused too! Three Dr.'s, 3 opinions! The ONLY thing I know for sure is that I have 2 tumors in my left lung (I think) My sister went thro' the same thing here when she had liver cancer, they kept telling her it was her gallbladder!...I finally told her Dr. I wanted to take her to the Mayo Clinic and within 3 hours they had the diagnosis and treatment plan in place! Unfortunately I don't have the resources for that now. And I have no insurance or medicaid...I'm lucky these Dr.'s have agreed to see me! I had a really hard time finding a Dr. here in town and the PCP I have now won't see me unless I have $50 for the office call. Believe me...sometimes that isn't easy! Anyway, I think it is best, in my situation, to just let them do the surgery Monday if that is what it takes to get to the bottom of this! I have been dealing with it since Jan., I want them to do something! Hi welcome here. I am so sorry for your situation especailly I know you are worried for your kids. Good luck with your surgery as you are lucky you can have surgery. You have a great attitude and that is half the battle there. Keep it positive and know you are in for the fight of your life. But you will get through this. I like Cindi is concerned who is going to take care of your children when you come home from the hospital as you will need to rest for a little while. Could you kids go with your ex or do you have family that could help you out? Please keep us posted and know you are not alone here. We will help you get through this. Best of luck on your surgery. HOping it all can be removed and you are soon cancer free. please consider calling social security to begin applying for disability benefits. It is a process but the first telephone call is very important. Please call today. If you delay the call you delay months worth of benefits. Hi and welcome and good luck with your surgery. Today I had my stress test, the Dr.'s office called and left a message that surgery has been postponed...what next! I'm kind of relieved but now I have something else to worry about!